Have you already taken an advantage of savings with coupon from U.S. Tommy Bahama? If not, read this! 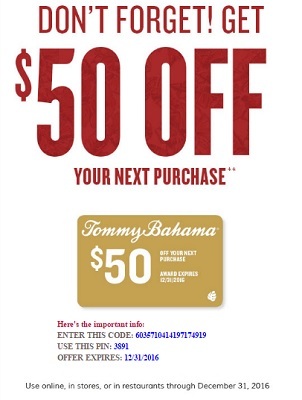 If you print your Tommy Bahama coupon and if you bring it to your nearest U.S. Tommy Bahama store location you can get $50 off your next purchase. You can also take an advantage of this offer when you shop online or when you visit any U.S. Tommy Bahama restaurant. You can get your coupon through Tommy Bahama emailing. Source of the information is Tommy Bahama. The offer is valid until December 31, 2016. For more details visit any U.S. Tommy Bahama store location or Tommy Bahama online.